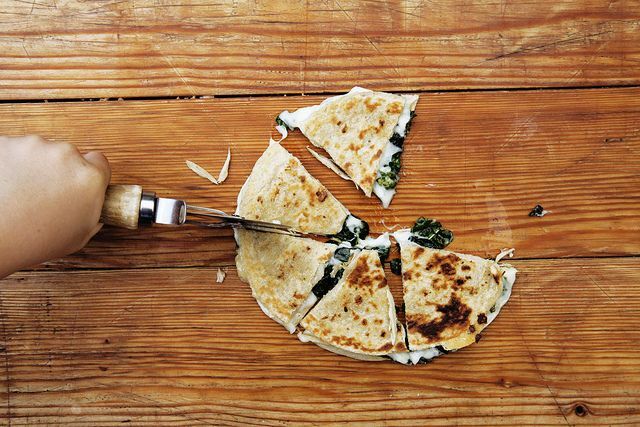 Today: Elevate your quesadilla -- this is how. After getting shot in the heart by a homemade bow and arrow -- while coming down with a cold. After baking a Meyer lemon raspberry cake, massaging heaps of kale, and prepping two batches of tart dough. Between the morning and afternoon rounds of laundry folding, dish washing, dog walking, and time-out dispensing. While trying to figure out if I’m supposed to feed a cold and starve a fever or starve a cold and feed a fever or just climb into bed and give up. And before locating the blow torch and almost setting s’mores cupcakes -- and my hair -- on fire, we gleefully inhaled kale and corn quesadillas with yoghurt and Sriracha. Because we wanted to. De-stem a bunch of kale, and stack the leaves. Chop them into one-inch wide strips. Wash. Dry well. Coat leaves with 1 tablespoon of olive oil (or garlic oil if you have it). Tenderize by squeezing the greens in your hands. Be aggressive. Do it for a few minutes -- it’s worth it. Shuck a few ears of corn, and then slice off the raw kernels with a serrated knife. Mix with the kale. To the kale and corn mixture, add at least one clove of grated or chopped garlic, another tablespoon of olive oil, a splash of Champagne vinegar, a pinch of salt, a finely chopped shallot, 1/3 cup chopped herbs (parsley, mint, and/or basil). Taste. Adjust seasoning. You’ll probably need a bit more salt and maybe some more vinegar. At this point, the salad will hold up for a few days in the fridge, and it just gathers more flavor as it sits. Eat it now, if you like; toss it with sliced cabbage or pasta. 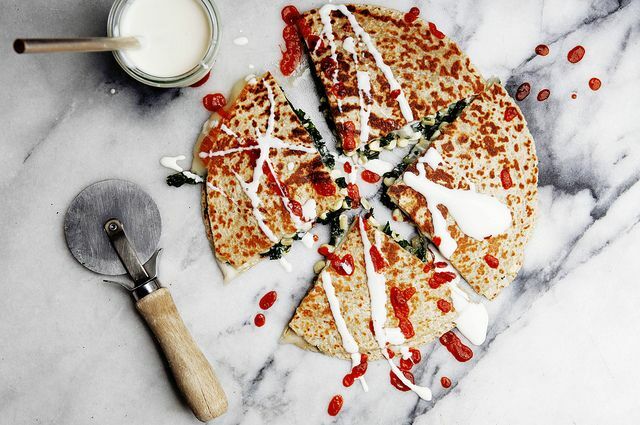 If you’re going the quesadilla route (which you should), crank up the heat under a griddle or frying pan and coat it with a thin slick of vegetable or olive oil. When the oil is smoking, turn the heat down to medium and place a tortilla in the pan. Cover the tortilla with slices of Monterey Jack cheese. Spoon kale and corn salad all over the cheese (leaving a bit of the cheese exposed so that the top tortilla sticks). Cover with another tortilla. Oh-so-carefully and quickly flip the quesadilla when the first side is crispy and brown. Remove from the heat when second side is done and place on a cutting board. Let it sit for one minute so that the cheese doesn’t squeeze out when it’s cut. Slice with a pizza cutter or scissors. Splatter with yoghurt, crème fraîche, or sour cream. Serve with Sriracha. I made a very quick winter version of this by sautéing the kale with some red onion and adding frozen roasted corn kernels and finishing it off with a little balsamic reduction. Can't wait to try the salad version in the summer. THIS IS AMAZING. Perfect lunch. Will go immediately into my recipe rotation. They post links to "recommended recipes" for the ingredients coming out that week in the CSA. It helps with meal planning and I keep finding some really awesome food sites like yours! I ran across this recipe last year via our CSA and-- ah!-- we now eat this at least once every other week. So easy to make! Such an excellent balance of flavors! My toddler and husband both beg to have it again and again. Love it. cool! what do you mean you ran across the recipe via your CSA? very curious. Oops. I meant to make that other comment as a response to this one. Sorry about that. how cool. which CSA? where do you live? love that they are sharing recipes. With this recipe you are responsible I bit my fingers twice! So good so yummy, especially now with the World Championship soccer :) Thanks for sharing this recipe! sorry about your fingers! glad you like the recipe. i had forgotten about it. need to bring it back into the rotation. this was oh-so-delicious! I added a couple dashes of cumin to the corn/kale mixture to bring some nutty warmth to the dish. i'll definitely be adding this to my repertoire. This was delicious and also kid approved. Massaging kale is a cool trick. I feel like tortillas are the type of thing I usually have leftover from another recipe. Not anymore. i just reheated one from the weekend. they even hold up that way. i could probably freeze slices for the kids' lunches. all the components are quite resilient. This is beautiful and I'm making it at the very next opportunity possible.